Preferred Habitat: Areas with tall trees, usually close to water. Seasonal Occurrence: Common in winter; uncommon in summer. Notes: Our national emblem since 1782, the Bald Eagle is a symbol of freedom, longevity, and strength. An adult Bald Eagle stands 3 feet tall, weighs as much as 14 pounds and flies on a wingspan 6 to 8 feet. Adult Bald Eagles have white heads and tails with dark brown bodies and wings. Their legs and bills are bright yellow. Immature birds have mostly dark heads and tails; their brown wings and bodies are mottled with white in varying amounts. Young birds attain adult plumage in about five years. Bald Eagles are present year-round throughout Texas as spring and fall migrants, breeders, or winter residents. 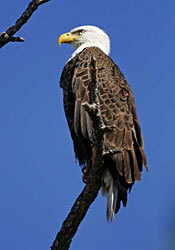 The Bald Eagle population in Texas is divided into two populations; breeding birds and nonbreeding or wintering birds. Breeding populations occur primarily in the eastern half of the state and along coastal counties from Rockport to Houston. Nonbreeding or wintering populations are located primarily in the Panhandle, Central, and East Texas, and in other areas of suitable habitat throughout the state. Bald Eagles build some of the largest of all bird nests—typically 5 to 6 feet in diameter and 2 to 4 feet tall. Since Bald Eagles eat primarily fish, their nests are near lakes, reservoirs, rivers and creeks. Eagles also will feed on carrion, ducks, geese and small mammals. The Bald Eagle’s recovery from near extinction is a spectacular conservation success story. The DDT ban, legal protections and habitat restoration have all contributed to a dramatic resurgence. From a dismal mid-1960s population of about 450 breeding pairs in the lower 48 states — including only five in Texas — the birds have recovered to about 10,000 breeding pairs in the lower 48 states, with roughly 156 pairs in Texas. 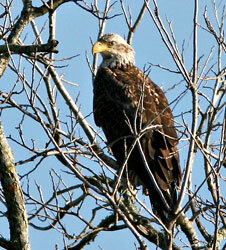 The Bald Eagle was removed from the endangered species list in 2007.